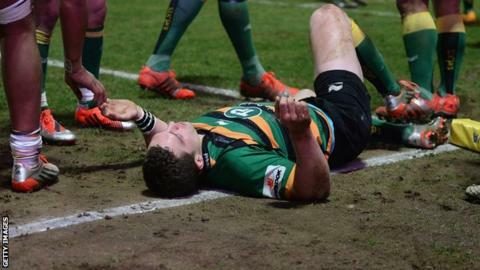 Wales boss Warren Gatland is "hugely worried" about George North's future after the wing's recent concussions. North, 23, suffered a fourth head blow in five months while playing for Northampton against Wasps in March. He did not play in April on the advice of a neurologist and, although he could return to play for Saints this season, Gatland hopes he will not be risked. "If he gets another knock he is going to have to be out for six months or a year or something like that," he said. Head coach Gatland told the Sunday Telegraph he had met North and his agent last week. "He's been out for a considerable amount of time but it's one of those situations where he's such a young player, if he picks up two or three more of those in the next year, that's going to finish his career, isn't it?" English Premiership leaders Northampton have one game left in the regular season and have already secured home advantage for the play-off semi-finals. That means North could play again before Wales convene for their World Cup preparations. The former Scarlets wing missed Wales' 12-6 win over South Africa in the autumn after being concussed against New Zealand, and was then struck twice on the head while playing against England during the Six Nations. Wales' coaching staff were criticised when North remained on the pitch against England despite his two blows to the head. Gatland said he was "very upset" by the criticism, adding he was "very conscious of putting players first". He said: "If we had seen that we would definitely have taken him off. There was definitely no negligence on our part." Wasps forward Nathan Hughes successfully appealed against his three-match ban for the incident that left North unconscious in March.